1 A majority of Americans believe the U.S. is one of the greatest nations in the world. 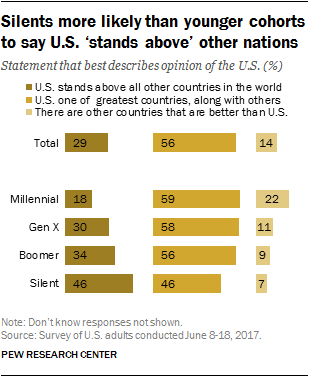 More than eight-in-ten (85%) said in a June 2017 survey that the U.S. either “stands above all other countries in the world” (29%) or that it is “one of the greatest countries, along with some others” (56%). 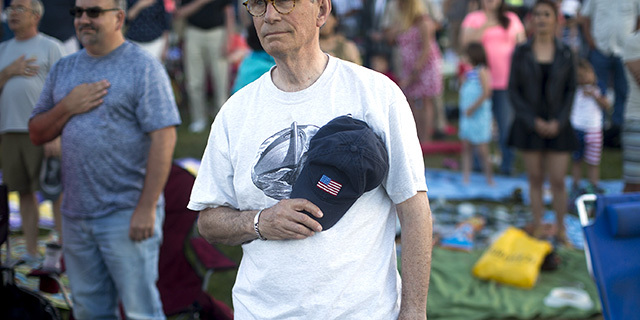 While large shares in all adult generations say America is among the greatest countries, those in the Silent Generation (ages 73 to 90 in 2018) are the most likely to say the U.S. “stands above” all others (46%), while Millennials are the least likely to say this (18%). 2At the same time, nearly seven-in-ten Americans (68%) say the U.S. is less respected abroad than it was in the past. There have been considerable changes in how Republicans and Democrats view the global level of respect for the U.S., according to a survey conducted last year. Last fall, 42% of Republicans and Republican-leaning independents said the U.S. is less respected than it was in the past, the lowest share saying this in more than a decade. In comparison, 87% of Democrats and Democratic leaners said the U.S. is less respected than it was in the past, an increase from 58% in 2016. 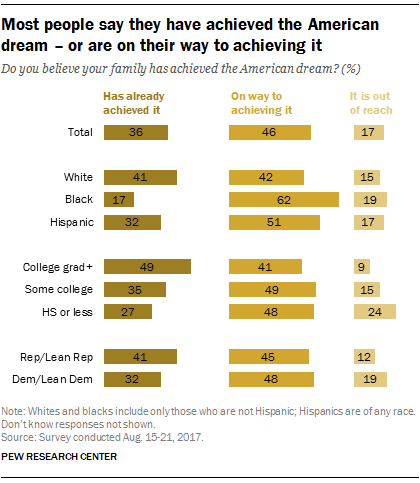 4 Most Americans say they have achieved the “American dream” or are on their way to achieving it. Just 17% of Americans say the American dream is “out of reach” for their family, according to an August 2017 survey. 5 About two-thirds of Americans say the country’s openness to people from around the world is “essential to who we are as a nation.” Just 29% say that if America is too open to people from other countries, “we risk losing our identity as a nation,” according to a summer 2017 survey. Eight-in-ten Millennials say America’s openness is key to the nation’s identity, compared with 68% of Gen Xers, 61% of Boomers and 54% of Silents. Democrats and Democratic-leaning independents are more likely than Republicans and Republican leaners to say that America’s openness is essential to the country’s identity (84% vs. 47%). 6A majority of Americans say the U.S. is a better place to live as a result of its growing racial and ethnic diversity. Just 9% of Americans say growing racial and ethnic diversity makes the country a worse place to live, according to a survey conducted this spring. Partisans differ in their views: While seven-in-ten Democrats and Democratic-leaning independents say the growing diversity in the U.S. makes it a better country to live, 47% of Republicans and Republican leaners say the same. More highly educated adults are more likely to embrace the effect of growing diversity on the country.